Retailers will be given four weeks to re-price goods when VAT returns to 17.5% in January, after pressure from the British Retail Consortium (BRC). Shops were given two weeks notice to reduce the price of goods when VAT was lowered to 15% in December 2008. The BRC calculated that re-pricing at the time cost retailers close to £90m in lost revenue. Chancellor Alistair Darling announced the return to 17.5% VAT in his pre-Budget report in the House of Commons. The change from two weeks to four weeks will be a permanent change which will also apply to any future VAT rate changes. Chancellor Alistair Darling announced that VAT would be cut to 15% in his pre-Budget report last year in a bid to encourage consumers to spend more and boost the economy. At the time it was estimated the change would cost the Treasury around £12.5bn and save the average earner around £170 a year. According to the BRC the VAT cut has had a "very limited effect" on helping retailers through a tough financial year. 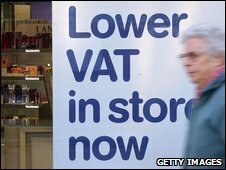 Now some analysts think the VAT raise could put some people off shopping. "I think it will hit spending more than people think," said Greg Hodge, research director at Planet Retail. "I think there's the notion that when things go down consumers don't notice that much, but when it's taken away from them they will get quite upset." In a recent poll, commissioned for the BBC programme Money Box, 27% of people said they would bring forward their spending before the sales tax increased to 17.5% in January. Almost one-third, 32%, of respondents said their spending would decrease after the VAT rate was increased. And another 73% wanted the lower rate to be extended.